What you value may be more important than what you own. To follow through on your commitments -- to yourself, your family, and your ideals -- you need to think ahead. A personalized estate plan is important in helping to protect your family and your legacy. Business ownership brings its own set of responsibilities. Changing your current business structure or successfully transferring your business before you retire requires careful planning. The amount you will need in retirement depends on the age you plan to retire, your desired retirement lifestyle, how long you expect to live and the rate of return that you expect to earn on your investments. Social Security and employer-sponsored pension plans will probably provide less of what you will need than they did for your parents. Education planning for your children can be a major financial consideration. Planning early allows you to take advantage of the time value of money and help minimize the savings requirement. Ensure college expenses are properly planned -- include tuition, room and board and living expenses. Factor in an inflation rate for the rising cost of tuition. Should you consider planning for post-graduate studies? Do you expect your child/children to receive scholarships or financial aid? You can now receive the same portfolio management services as many institutional investors-whether it is a separately managed account or a mutual fund wrap portfolio. Every investor is unique, and investment advisory services provide you with professional investment advice and a personalized investment strategy. Whether you're seeking a tailored, professionally managed portfolio, or the convenience and simplicity of a diversified mutual fund wrap program, your investment choice should focus on meeting your financial goals. During this process, you should consider current and future growth objectives, income needs, time horizon and risk tolerance. 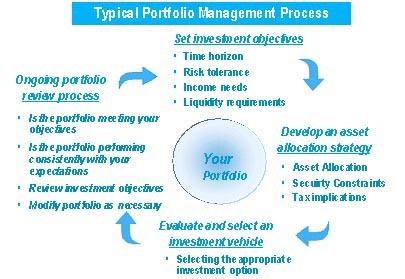 These considerations form the blueprint for developing a portfolio management strategy. The process involves, but is not limited to, the following important stages. A sound plan must address the insurance coverages you, your spouse and family members may require. Life insurance is used to pay for funeral expenses, repay outstanding debts, make charitable donations and provide living expenses for surviving family members. It can also be used to cover estate taxes and probate fees to enable your estate to be liquidated in the most appropriate manner. Disability income insurance is to help partially replace income of persons who are unable to work because of sickness or accident. In terms of its financial effect on the family, long-term disability can be just as severe as death. Disability income protection can come from several sources: social insurance programs, employer-provided benefits, and individually purchased policies. Long Term Care Insurance is relatively a new type of insurance product. Many people do not understand what Long Term Care insurance policies cover, how and when the policies benefit, and who should obtain coverage.